Since we are covering brachiopods in my paleontology course this week, I’ve chosen a very recognizable genus from the Upper Ordovician of Iowa for our Fossil of the Week. This wrinkly strophomenid brachiopod is of the genus Leptaena Dalman, 1828. It is one of the most common brachiopods in the Lower Paleozoic, ranging from the Ordovician into the Carboniferous. The two specimens above are showing their dorsal valve exteriors. The same specimens are here turned over, showing the ventral valve exterior on the left and the dorsal valve interior on the right. I always learn something when writing these brief fossil posts. These specimens are labeled in our collections as Leptaena rhomboidalis (Wahlenberg, 1818), the most common species name I’ve seen for this genus. Hoel (2005, p. 266), however, says: “In fact, L. rhomboidalis is known only from Gotland, [Sweden,] where it was confined to moderate energy reef environments during the early Wenlockian [Silurian].” So this species is only Silurian, and only found on a Swedish island. I’ll just leave it in open nomenclature, then, as Leptaena sp. The taxonomic details of the many species in the genus are beyond my skills and experience. The erroneous species name, though, does introduce us to a fascinating Swedish naturalist named Göran Wahlenberg (1780-1851). This man is best known as a botanist, but he also had many geological and paleontological interests. He entered Uppsala University in 1792, earning a doctorate in medicine in 1806, and then joining the faculty to teach botany and medicine (with much more emphasis on the first). He occupied the university chair previously held by the demigod taxonomist Carl Linnaeus. 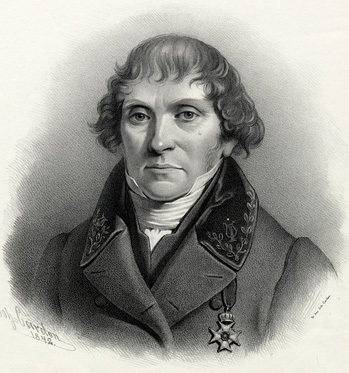 He was elected at a young age to the Royal Swedish Academy in 1808. Wahlenberg’s primary work was with plant biogeography, especially in Sweden, but he made many scientific forays throughout Scandinavia and into Central Europe. He named Anomites rhomboidalis in 1818, which was later added to the genus Leptaena. Wahlenberg studied glaciers in Scandinavia, making many observations about glacial striations and moraines we would recognize today. His main overarching theory of Earth history was that massive vulcanism in the “pre-Adamite” past caused great climate changes, eventually producing a global flood, the evidence for which included glacial erratics strewn throughout northern Europe. He was one of the first naturalists to posit connections between atmospheric composition and global temperatures. What the scientific biographies of Göran Wahlenberg don’t often mention is that he is credited as the first person to bring the pseudoscience of homeopathy to Sweden. He studied the medicinal ideas of the founder of homeopathy, Samuel Hahnemann, and declared they had merit. He was an enthusiastic advocate, making him one of the “pioneers of homeopathy”. In his defense, at that time homeopathy was no doubt safer than mainline medicine! Hoel, O.A. 2005. Silurian Leptaeninae (Brachiopoda) from Gotland, Sweden. Paläontologische Zeitschrift 79: 263-284. Kelly, F.B. 1967. Silurian leptaenids (Brachiopoda). Palaeontology 10: 590-602. Wahlenberg, G., 1818. Geologisk avhandling om svenska jordens bildning. Uppsala.